Google Adwords is an effective advertising platform that displays your website details directly to your target market appearing before the regular search results. website listing will display in places that are relevant to your target market. You can set your ads to display within a few kilometres of your shop, display to an entire town or city, or to the whole world. Set ad schedules so your ads are only displaying at prime times for potential customers. 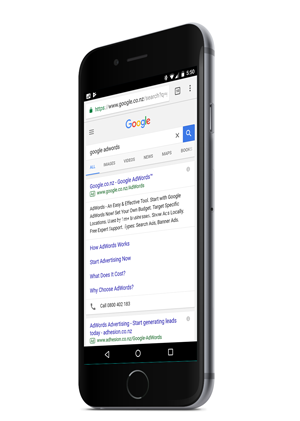 You can choose to display your ads on the vast Google display network, which includes Google search, YouTube, Apps, millions of websites that display Google’s ads. A great thing with Google Adwords is that you are only charged when you get traffic to your website. What’s this going to cost? You have complete control over your Adwords budget, you can set the daily or monthly budget to ensure you spend exactly how much you want. Once your Adwords account is set up, we can leave the ads running with the initial settings, and aside from the cost of the advertising, unlike other agencies that can charge a large weekly fee, there will be no other charges from me. If you would like monthly reports, and additional keyword research or ad optimisations, I can do all of this from just $50 per month. Got a question? Say hi!